Limited to 300 hand numbered copies. 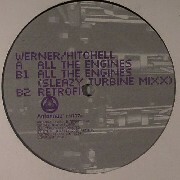 Antennae international present “All The Engines” from Chicago producers Josh Werner (former partner of DJ Sneak on Strictly Rhythm, Force Inc. & Relief Records) & Steve Hitchell (of Echospace) with their long running collaborative project. A modern look at the jak track aesthetic; the original mix melds boomin 808 and crispy hats with a slippery, funked up bassline while the flip tamps down the BPMs to a swingin’ 116 and amps the analog machine funk in the “sleazy turbine” mixx. The release rounds out with the atmospheric soundscape of “retrofit” drenched in reverb and subterranean bottom.